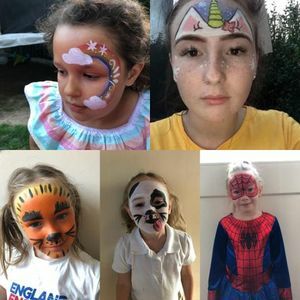 If you are organising a party or event especially with children a face painter is a must have. I can fill your event with many colourful faces. We use Snazaroo. They are water based face paints. Suitable for sensitive skin and fragrance free. They are also easy to clean off- Simply remove with soap and warm water; there is no need for scrubbing or harsh removers. Do you have a portfolio, designs or reference photos of your face paint work to review? Yes. We have a book that we bring along to all face painting parties and events which we give to children to look at. There are a range of designs of our work. We allow children to choose what they would like by looking through the book. Depends normally around 15 minutes.